In this excerpt, Captain Mynta and the other fighters are preparing for their first monster hunt. Mynta thinks that handling fangfrogs should be an easy, routine task, but Mage Ameyron is worried that the monsters could get hurt in the process, and he needs a live specimen for his zoological gardens. He offers some suggestions to the fighters, but he doesn’t know much about how real monster hunts work, and his ideas could do more harm than good. Benu covered a laugh with his hand. Ameyron came down the stairs to the main deck. “What about a net?” He held out a fishing net with strips of metal tied to the corners. “I was trying to think of a way to incorporate my new alloy into the design so its magic-canceling properties could be used for offense. You could wave the net at the frog, like so.” He shook it out, making a shooing motion. The mage threw up his hands. “Fine, try it your way. I won’t complain so long as you bring me back an intact specimen.” He turned and stomped away to his cabin. 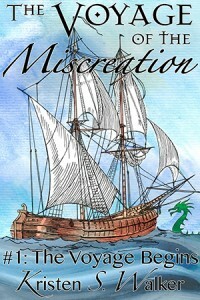 The first episode of The Voyage of the Miscreation will be published in one week: Friday, July 25!